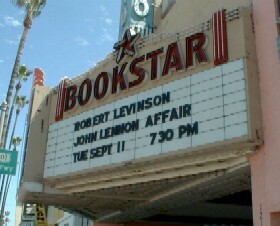 The marquee that didn't matter for an event that was scheduled for Bookstar in Studio City, CA, and cancelled on Sept. 11, 2001. No explanation required. The marquee all aglow for the appearance that did happen, on October 29. 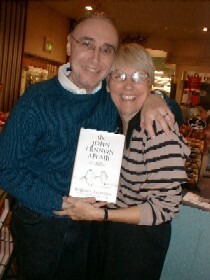 Bob gets a warm welcome from Bookstar's event coordinator, Shelly Hungerford. 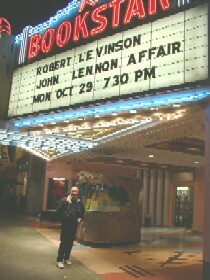 Among those in the audience was musician Lee Newman, who stopped in (he explained) upon spotting the marquee, because he was a good friend of Harry Nilsson, knew of Harry's friendship with John Lennon, and wondered if Harry might be mentioned in The John Lennon Affair. 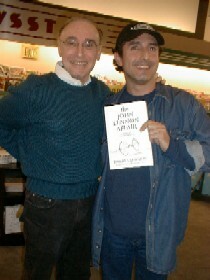 Lee quickly purchased a copy when he heard that Harry (as himself) plays a major role in the novel.